For our Handprint Calendar for the month of June, we made this Handprint and Footprint Lobster I saw on the Meet the Dubiens Blog(so many cute ideas). I used scrapbook paper that resembled sand for the background and blue seashell patterned scrapbook paper for embellishing. 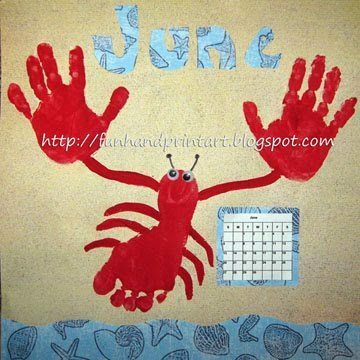 I placed one footprint and each of his handprints on the sand patterned paper. Paint in the rest of the red details and add googly eyes (or paint in the eyes). Great summer print. So cute. What a fabulous idea..I am using it with my two year old to make a birthday card for daddy..we live ib Mombasa so it is always Summer and always beach time here. I love all of your designs…what a great blog!